The Align tool is useful to align the image layers with various image objects. When this tool is selected, the mouse pointer turns to a small hand. By clicking on an element of a layer in the image, you choose the layer which will be moved (with Shift + click, you can choose several layers to be aligned); this focused layer has small squares in corners and is called target. Various buttons in the dialog allow you to select how the layer will be moved. And you can select the image object (other layer, selection, path...) the selected layer will be aligned with. by using the Q keyboard shortcut. You can select several layers by holding Shift when clicking the layers. Sometimes it's easier to choose multiple layers using rubber-banding: click somewhere outside an imaginary rectangular region covering the layers you want to choose. Then drag out that region by moving the pointer, and release the mouse button. 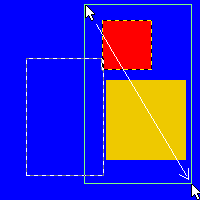 Now every layer, which is completely inside the dragged rectangle, is selected. 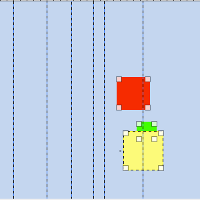 Note that now there is no target “first item” the selected layers can be aligned on. To reference the image object the layer will be aligned with. First item: the first selected item when selecting multiple layers holding the Shift key. Note that there is no “first item” when you select multiple layers using rubber-banding. Image: the image is used as alignment reference. Selection: the selection is used as alignment reference. Active layer: the active layer, in the layer dialog, is used as alignment reference. Active Channel: the active channel is used as alignment reference. Active Path: the active path is used as alignment reference. 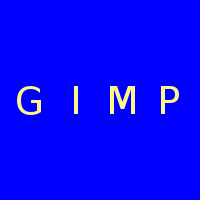 An image with a selection, a text layer and an active layer. This layer is cropped to content. Image is the alignment reference. The (Align right edge of target) command has been used. These buttons become active when a target is selected. : to align left edge of target with left edge of reference. : to align center of target with center of reference horizontally. : to align right edge of target with right edge of reference. : to align top edge of target with top edge of reference. : to align center of target with center of reference vertically. : to align bottom edge of target with bottom edge of reference. These options are used when you have several targets and want to arrange them. 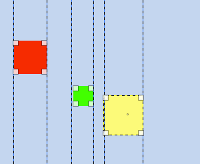 “targets” are the layers selected with Shift + Click. Note that “Relative to” options are active when using Distribute. : to distribute left edges of targets with left edge of reference. : to distribute centers of targets with center of reference horizontally. : to distribute right edges of targets with right edge of reference. : to distribute top edges of targets with top edge of reference. : to distribute centers of targets with center of reference vertically. : to distribute bottom edges of targets with bottom edge of reference. : to distribute targets evenly in the horizontal. : to distribute targets evenly in the vertical. Last both buttons ones are new in GIMP-2.10. This offset can be positive or negative and is expressed in pixels. 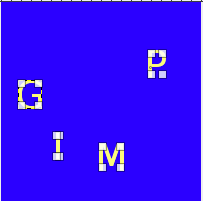 Distribute add it to the left edges, horizontal centers, right edges, top edges, vertical centers, or bottoms of targets. Base image: three layers. (Distribute right edges of targets) will be used. Active layer is yellow (reference). 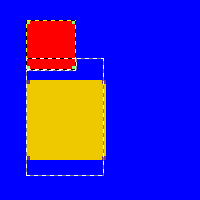 Offset = 0: all layers are aligned on the the right edge of the yellow layer. Four text layers, with same size. We want to align them at center of image. We select them as targets with Shift + Click. 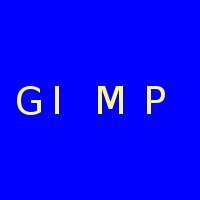 Alignment reference (Relative to) is “Image”. Offset = 0. We used the (Distribute vertical centers of targets) command. After using the (Distribute targets evenly in the horizontal) with offset = 5. 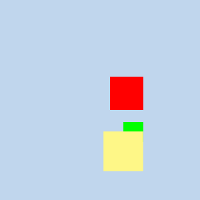 We clicked left from and above the red layer, and dragged out a region covering the red and the yellow layer by moving the pointer towards the bottom right corner. “Selection” is the reference. After a click on the button, both layers align with the left side of the selection.